Axenstar, from Sweden, is another band from which many observations can be made. 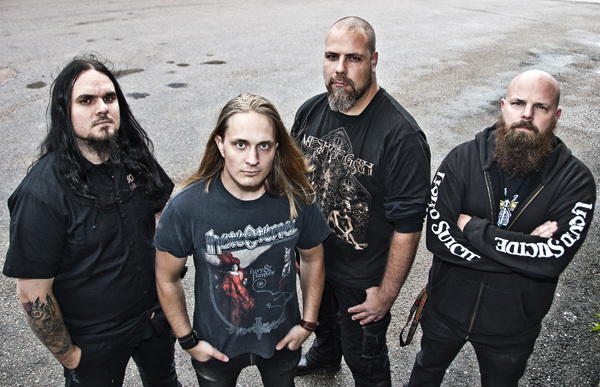 For instance, if there was a heavy metal dictionary, and you looked up Scandi power metal, there could easily be a picture of the band next to the entry. They've been deciminating their power metal since 2001. Another observation of note is that their output has been a bit sporadic over the same time period. It's been three years since the last album; five years from the one before that. Things are getting better. Additionally, and another sign of improvement, the band has had a stable lineup since 2008, something that provides for some songwriting and compositional consistency. And perhaps that's the best way to describe Axenstar's sixth album, Where Dreams Are Forgotten. It's a work of power metal consistency for the band. They stray little from the power metal structure of bombastic riffage, blistering, speedy, rhythm section, and an abundance of guitar solos, wrapped in melody and vocal harmonies with some stray synths thrown in for flavor. It's a the generic formula for the metal genre. Conversely, it's also the fodder for the naysayers and pundits who routinely love shitting upon classic power metal. To their credit, there's some redundancy within this album, another characteristic of classic power metal, but of most musical genres as well. Axenstar could have easily trimmed this album down to nine songs and nobody would have missed anything. But as power metal goes, and has gone, in it's first and latest forms, it's ultimately a guilty pleasure. If you dig it, you look for it and swill it down like so much Jagermeister. In this sense, power metallers will rejoice as Where Dreams Are Forgotten will give them the necessary metal woodie, so to speak. What Axenstar has succeeded in doing is winnow their power tunes into compact packages. Most every song clocks in around four minutes, with one at three and a half, like so many pop and rock songs, without sparing the necessary power metal elements. Throw in some true rock groove into a song like Greed and you have something close to commercial accessibility. Mostly, however, everything is as said earlier, typical speedy power metal in all it's bombastic glory. Yet, there is one definite weak point to the album: the vocals are quite muffled, suppressed in the mix, and basically overwhelmed by the other instruments. Favorite picks: Sweet Farewell, Greed, Inside The Maze, and Annihilation. Recommended for power metal fans everywhere. 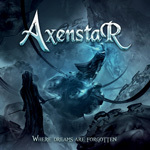 Axenstar's Where Dreams Are Forgotten is typical speedy power metal in all it's bombastic glory.